Streets make up more than 80 percent of all public space in cities, yet street space is often underutilized or disproportionately allocated to the movement of private motor vehicles. Excess impervious surface contributes to stormwater runoff, posing a threat to the environment and human health, and often overwhelming sewer systems. This excess asphalt also poses a threat to public safety, encouraging faster speeds and dangerous conditions for people walking and biking. The Urban Street Stormwater Guide begins from the principle that street design can support—or degrade—the urban area’s overall environmental health. By incorporating Green Stormwater Infrastructure (GSI) into the right-of-way, cities can manage stormwater and reap the public health, environmental, and aesthetic benefits of street trees, planters, and greenery in the public realm. With thoughtful design, GSI can bolster strategies to provide a safe and pleasant walking and biking experience, efficient and reliable transit service, and safer streets for all users. Building on the successful NACTO urban street guides, the Urban Street Stormwater Guide provides the best practices for the design of GSI along transportation corridors. The authors consider context-sensitive design elements related to street design, character and use, zoning, posted speed, traffic volumes, and impacts to non-motorized and vehicular access. The Guide documents and synthesizes current practices being developed by individual agencies and recommends design guidance for implementation, as well as explores innovative new strategies being tested in cities nationwide. The guidance will focus on providing safe, functioning and maintainable infrastructure that meets the unique needs and requirements of the transportation corridors and its various uses and users. The state-of-the-art solutions in this guide will assist urban planners and designers, transportation engineers, city officials, ecologists, public works officials, and others interested in the role of the built urban landscape in protecting the climate, water quality, and natural environment. "Makes the case that green stormwater infrastructure can be combined with transportation infrastructure projects to help cities meet their stormwater management goals, save money and, in some cases, make streets safer for walking and biking...The [Urban Street Stormwater Guide] provides a variety of green stormwater infrastructure designs for cities to implement, from major capital projects to low-cost neighborhood intersection treatments." "The Urban Street Stormwater Guide delivers one of the most comprehensive guides on how to combine complete street design and green infrastructure stormwater management...a valuable resource to those planning and designing green street projects." "Practical, thoughtfully laid out, and tightly focused on its subject, the Urban Street Stormwater Guide is a must-have resource for anyone involved in stormwater management." "This book is an invaluable guide for city planners, environmentalists, and citizen activists." "The Urban Street Stormwater Guide synthesizes a wealth of local experience into a national resource for sustainable design. The result of a collaboration between transportation and stormwater experts in multiple cities, the guide illustrates how streets of every size can incorporate stormwater management techniques with sustainable, multi-modal mobility. This guide provides the tools necessary to find value in water and to design better cities." "Too often we've learned the hard way that the water always wins. This guide sets out a bold vision for how cities can work with water, not against it. It is a blueprint for how to create safe, complete streets that view stormwater as a resource to be integrated into the natural fabric of the cities we want." "This book is full of best practices from the city officials who have been implementing urban street stormwater solutions in the real world, and brings them together in an easy-to-use manual of the caliber of NACTO's earlier guides. It will influence the direction of practice in the same way, giving confidence to those who want to implement these ideas on their own streets." Excess impervious surface contributes to stormwater runoff, posing a threat to the environment and human health, and often overwhelming sewer systems. By incorporating Green Stormwater Infrastructure (GSI) into the right-of-way, cities can manage stormwater and reap the public health, environmental, and aesthetic benefits of street trees, planters, and greenery in the public realm. With thoughtful design, GSI can bolster strategies to provide a safe and pleasant walking and biking experience, efficient and reliable transit service, and safer streets for all users. 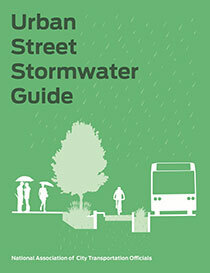 Join NACTO, River Network, and Island Press for an up close look at the forthcoming Urban Street Stormwater Guide, and learn how to provide safe, functioning, and maintainable infrastructure that meets the unique needs and requirements of the transportation corridors and its various uses and users. In the newest episode in our series of podcasts on urban resilience, Infinite Earth Radio host Mike Hancox interviews Corinne Kisner, who serves as the Director of Programs at the National Association of City Transportation Officials (NACTO). In the interview, Kisner explains sustainable stormwater management and why transportation officials should care. She also details the benefits of using green stormwater infrastructure to improve street design and how underserved communities can use green infrastructure to build community resilience.